I first saw Dixie Evans when CNN interviewed the woman known as the ‘Marilyn Monroe of Burlesque’ and immediately thought how much fun it would be to photograph her. As Dixie spun her tales, I knew it was exactly the sort of shoot I dreamed of landing. In life, you can either sit back and wait for something to happen or you can just go out and do it. So I called Dixie and to my good fortune, she said sheâ€™d love to be photographed. On a sunny afternoon in March of 1993, my wife Fazia and I headed from LA onto Route 66 to Dixie’s ‘Exotic World’ ranch in Helendale, California. We spent an absolutely wonderful afternoon photographing Dixie in the California desert and we quickly became friends for life. The greatest thing about being a photographer is dropping into the lives of people who become your friends. I canâ€™t think of a better way to experience the world around you. We came back to Helendale a couple months later to shoot our first ‘Exotic World’ Burlesque Reunion. At in Dixieâ€™s ranch, we met Dixie’s friends – burlesque legends like Tempest Storm, Jeanine ‘the Eyeful Tower’ France and Flame O’Neil. While looking at the rows of publicity photos by â€˜Bruno of Hollywoodâ€™ at the Exotic World museum and was struck by how much they reminded me of the classic Hollywood photos of the 30s and 40s. I realized I had a chance to put these burlesque legends back into the spotlight where they belonged. Like Jazz, Burlesque is a pure American art form. Burlesque is Americana. I began shooting it because I didnâ€™t want to see a part of Americana fade away. Iâ€™m overjoyed to see burlesque alive and flourishing today. This August 26 – September 1, burlesque performers will celebrate Dixie’s birthday with burlesque shows and events taking place all over the world in support and celebration of Dixie Evans Week. Please check out the list for a city near you! How could shooting portraits of Burlesque Legends lead to celebrity portrait photography? This interview with Tamara Lackey of the reDefine Show takes you through the journey. Along the way, we talk about the Art & Soul book and drop of few Secrets of Great Portrait Photography. Big props to Tamara, Kate Burgauer and Sarah Coppola of reDefine for this fab interview! 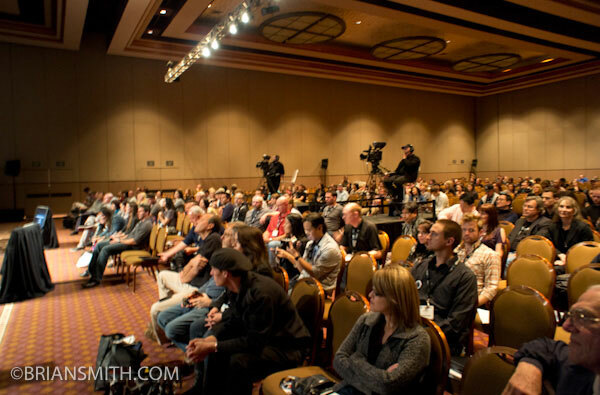 Speaking at WPPI 2011 has been a fantastic experience thanks to the amazing positive energy off everyone in attendance! Massive thanks to the great crowd at my platform talk ‘Secrets of Great Portrait Photography’ – you guys made this trip wonderful! My deepest thanks to everyone from Sony & Blue Pixel for a great trade show booth where I spoke on Location Portraits and did a live shooting demo of Burlesque dancer Miss Redd. Thanks to George Varanakis and Kate Volpe of WPPI for making this such a great show. I’ll be speaking about my favorite subject – capturing great portraits – at WPPI on February 22nd in Las Vegas. WPPI is always a great show for the portrait and wedding photography industry. I’m looking forward to taking the show to Vegas after a full house when I gave this talk at PDN PhotoPlus Expo. Celebrity portrait photographer Brian Smith will share the lessons he’s learned over the past 30 years capturing the faces of the famous, infamous and unknown as a top magazine portrait photographer. Brian will discuss his approach to editorial and commercial photography from concept to final images, and detailing his approach to lighting and problem solving on productions both small and large. He will also share secrets about how to quickly capture the personality of the people in your photographs. He will also discuss how personal projects can be used to generate editorial and commercial assignments, and allow your personal style to evolve and grow while generating assignments you love to shoot. 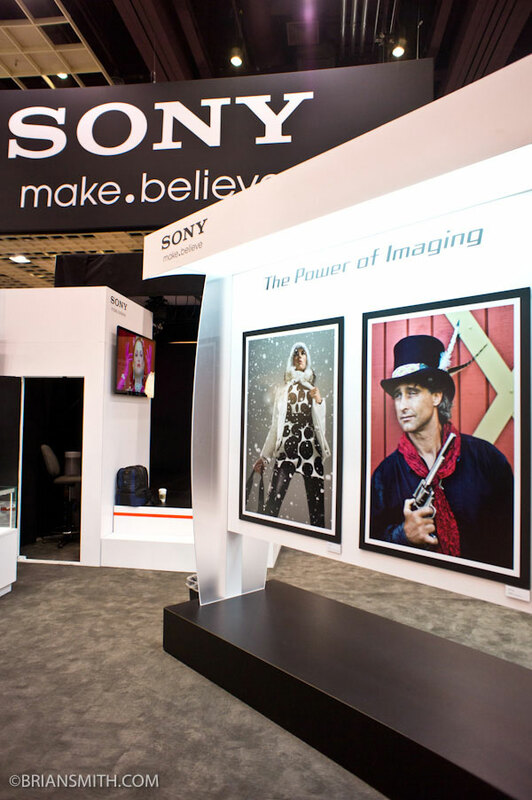 Be sure to stop by the Sony booth on the WPPI show floor where I’ll be speaking and doing lighting demos each day. It’s going to be an absolutely great show – hope to see you there! Imagine for a moment that you could watch Picasso paint…calculate the Theory of Relativity with Einstein…dunk on Michael Jordan…or have a beer with Hemingway while he penned a novel…Well, if you’re in BostonSunday, Nov 14 2010, you’re in LUCK. You can watch a true LEGEND in action when Tempest Storm takes the stage as her Las Vegas Review storms into Boston. This true Burlesque Legend who toured the world and dated Elvis brings her talents to Beantown alongside two Legends in the making, Kitten DeVille and my dear friend Angie Pontani.